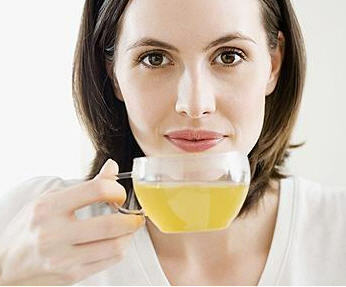 Archives for February 2012 | Your Health. Your Lifestyle. Children’s author Theodor Geisel, known better as Dr. Seuss, made his stories and messages memorable with his rhyming. Schedule escapes. Regular breaks can help you perform more efficiently. But they need to be true pauses from the grind. Step away from your desk or task and go outside. Use the free moments to call a friend, take a walk, or just listen to music. The pure joy of nothingness can clear your head and soothe your nerves so you return to your responsibilities with a fresh perspective. Laugh. Tickling the funny bone can actually boost immune and brain function, lower blood pressure, and release tension. Start your day by reading a joke or funny column. Tune into a comedy radio station or pop in a CD of your favorite comedian. When things get harried, stop and smile or make a goofy face at yourself in the mirror — it might be just enough to take the edge off. Step out of the box. Tour a new museum, sign up for a class, volunteer… or pick up an old Dr. Suess book and revisit your childhood whimsies. You’re pretty accountable when it comes to logging what you’ve eaten. But that daily latte habit may explain why you’re not losing as quickly as you’d like. After all, foam and syrup calories add up – in terms of pounds and pennies, since these drinks typically cost more than $2. Here’s how to save your dollars, and your waistline. Add it up, log it in. Track your beverage buys for one week. Carry a notepad and jot down all purchases (noncoffee drinkers can record diet sodas, smoothies, juices and teas). Think week off, week on. Limit your coffee splurges to every other week. On an “off” week, make a pot of coffee and refrigerate it for up to 7 days. Pour the brew over ice in a travel cup. For “on” weeks, indulge in a café fix, but skip syrup extras and pour your own milk to be sure it’s fat-free. Consider the exotic. Try flavorful java alternatives sold at natural food stores, such as genmaicha, a green tea with roasted rice that packs a fraction of the caffeine. You might love your short(s) of espresso, but here’s the jittery truth: It’s loaded with caffeine, which may trigger the production of stress hormones and cause blood sugar to drop. This, in turn, leaves you feeling more tired than before you took your first sip. Allow yourself a single shot in the AM, then switch to decaf. Still trying to implement that New Year’s resolution to eat healthy? While a complete dietary overhaul takes time, you can act immediately by tweaking simple habits. Liquid exchange: Guzzling calories not only pours excess sugar, artificial ingredients, and caffeine into your system, it can infringe on proper hydration — necessary for flushing out toxins and delivering nutrients to your cells. Swap out that mid–morning mocha with an 8–ounce glass of ice water to load up on your body’s fluid of choice. And when thirst strikes again, sip from the water cooler, not the soda fountain. Portion control: Studies suggest Americans chow down up to 8 times the grub they need. Take a good look at one of your meals today to carve the rations. Slice your sandwich in half and save the rest for tomorrow. Use a small dinner plate. Scoop just a single spoonful of potatoes, pasta, or rice. Wait 20 minutes, to see if you’re really still hungry, before getting seconds. And check out the Weight–control Information Network to learn how to eyeball serving sizes. 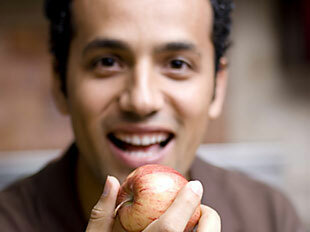 Selective snacking: Choose nutrient–dense foods to curb hunger and add health benefits. Ditch the bag of chips for a handful of nuts. Go green when choosing your side dish — a cup of broccoli or spinach salad. Reach for an apple when your tummy gets grumpy, or toss a few berries into your morning yogurt. Comfort: If they’re not comfortable, don’t buy them. 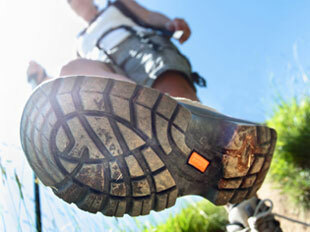 Even though some shoes will stretch, they may not necessarily be the best fit for your foot. Size: Your feet grow, change, and spread with age, so have them measured each time you try on a new pair. Varied styles fit differently, so keep looking until you find what works for you. Time: Shop for shoes late in the afternoon, when your feet have reached their largest size. Toe room: Your toes should have plenty of wiggle room. If they don’t, pass on that pair. Snug heels: If your heels slip out of the shoes when you walk, they’re not right for you. Loose heels can cause blisters and put an additional strain on the instep, which tries to hold onto the shoe. Once hailed the Holy Grail in the fight against joint pain and arthritis this compound has recently come in for some pretty heavy criticism which suggests that it is a sham and that it has no effect on the human body. So what is the truth after all many of us know people who use Glucosamine and swear by its effectiveness in relieving them from joint pain. The first thing to consider is where the research against Glucosamine has come from and who has founded it and you will not be surprised to find that it was the people who stand to lose most form its use, the big pharmaceutical companies. After all if people start using Glucosamine and it works they are going to lose out on the profit from their patented anti-inflammatory drugs and the like. So it’s all just a con promoted by the big, bad pharmaceutical companies then! Well if only it was that simple you see there are a few big, bad supplement companies as well and they may not be telling the whole truth either. You see Glucosamine comes in two different types, Glucosamine Hydrochloride (HCL) and Glucosamine Sulphate and because the former has a slightly higher concentration of Glucosamine (83% vs. 80%) it is the one that tends to get used in most of the supplements available today. But there is the problem it is not the best one to use as it requires the presence of Sulphur to enable it to work and that is why Chondroitin Sulphate is commonly added to the formulae. The problem is that this increases the molecule size to the point where it is difficult for it to be absorbed, in fact up to 70% of the active Glucosamine is wasted. The solution is to use Glucosamine Sulphate even though it is a far more expensive ingredient and much more difficult to source. You see in tests on people suffering from arthritis and osteoarthritis it has been found that the use of Glucosamine Sulphate has returned the affected joints to normal function in a very short time. This is due to its almost immediate bioavailability: within 30 minutes of consumption, 87-97% is in the blood and within 4 hours it is being absorbed by the joint cells. So while Glucosamine HCL will not do you any harm it will also not do you as much good as quickly as its more expensive relative Glucosamine Sulphate. Under these circumstances the cheaper version turns out to be more expensive and less effective. So where do the big pharmaceutical companies stand on the use of Glucosamine Sulphate? Well not surprisingly they are silent hoping that you the consumer will think that all Glucosamine is the same and that their drugs are the only true solution to the pain and suffering of joint related disease. If you suffer from Type II Diabetes then you should speak to your healthcare professional about the effects of Glucosamine as research has indicated that it can worsen insulin resistance. Otherwise if you suffer from joint pain and what to try a more natural treatment speak to your healthcare professional about the use of Glucosamine but make sure that it is Glucosamine Sulphate that you use as you do not want to waste your money on ineffective treatments. Zinc is one of the most important trace elements in our diet and it is required for more than 200 enzyme activities within the body. Zinc is the principal protector of our immune systems and is essential for the structure and function of cell membranes. It helps prevent blindness due to aging, treats infertility problems, maintains sense of taste and smell, prevents hair loss and treats acne and other skin problems. Good natural sources of Zinc are meat, mushrooms, oysters, eggs and whole grain products. The 1988-1991 National Health and Nutrition Examination Survey found that up to 45% of adults over the age of 60 had daily Zinc intakes well below the estimated average requirements. Supplementation along with a good multi-vitamin is suggested and an increase in Copper and Selenium should be considered. Zinc is thought to not be toxic although doses in excess of 150mg a day may cause nausea and vomiting. You may well not have heard of this substance but it is likely that it will not be too long before it is as well-known as aspirin. Serrapeptase is an enzyme which is fairly new to the scene in that it has only been studied for about 30 years. However in that time it has created quite a stir and the list of conditions which it has been suggested that it can cure has grown so long that if it can only do half of what is claimed it will have earned its title as the “Miracle” Enzyme. You see Serrapeptase is a Protease Type Enzyme that stops inflammation and dissolves non-vital tissue. Over the past 30 years studies have indicated that it can benefit in a huge number of conditions including: Arthritis, inflammatory Migraines/Headaches, and Chest Problems such as Bronchitis, Asthma, Bronchiectasis, Sinus, Blocked Arteries, Fibrocystic Breast Disease, Breast engorgement and Cancers. Enzymes are catalysts and fulfill many essential functions in the human body. There are Digestive enzymes, Metabolic enzymes and Clean-up enzymes which work with the vitamins and minerals we supply to our bodies and they provide the energy for us to function, the maintenance facilities to repair damaged bodies and the cleanup crew to scour out and discard the refuse and waste products and toxins. On a daily basis we obtain these enzymes form unprocessed, raw or little cooked food or by taking some form of supplementation. Studies have found that a 70 year old has only 20% of the enzymes found in the body of a 20 year old. This is a major part of the cause of age related diseases. So how many enzymes are there? Well that is difficult to answer, all that we can say is that in 1930 only 80 enzymes had been discovered buy by 2000 this had risen to 3,000 enzymes and the figure keeps on rising. In addition in all the studies that have been undertaken there have been no adverse side effects found from the use of enzymes. So if there are no side effects why are doctors not using them? There are many doctors that are starting to sue enzymes and other natural supplements but they are a small number who have started to look at medicine from a more eastern viewpoint. Unfortunately in the west our medical culture is more of disease management whereas the eastern culture is more based on health maintenance. In China you pay your doctor when you are healthy not when you are ill so he has a financial interest in keeping you healthy! Serrapeptase dissolves non-living tissue, blood clots, cysts and arterial plaque and inflammation in all forms. Much of the work on understanding what Serrapeptase can achieve I being undertaken. There have been some amazing stories about how people who were scheduled for heart bypass surgery were able to come off the surgery list after alternative treatments were tried using Serrapeptase and the previously existing blockages had literally been dissolved away.